Litro Magazine, March 2014. Original article. With swift, rehearsed motions I prop my bicycle onto my hip, swaying my body as a counterweight as I start the climb up the stairs. Music still blares in my left ear, too loud now there’s no traffic to drown it out, as I swing my wheels around corners, careful not to scrape the walls. At home I keep my bike in my hallway, as city dwellers do. The rustle of the traffic is still audible through thin walls and vibrating panes of glass, reminding us of the city that holds us. We love and hate the city, the London planet that’s our home. I live out East, and while I can travel for hours I rarely make it out West. It’s a different life out there, one of steady living and picnic-dense parkland, not at all like the flowering decay of the East. Here, change happens so rapidly it’s almost tangible. You don’t discover the personalities of the city until you’ve been here a while, and by then you shrug at the irony of having moved to London to explore the multitude, only to find yourself ensconced in a small pocket of this giant metropolis. We sought variety but once we arrived, we discovered what we really wanted was to find our people and to make a home. We build walls around the East London village and scowl at strangers. When visitors come from out of town we take them to the core of London, to the centre that all the London tribes share because no one actually live there. At least no real people do, only the Queen and her knights, but us mortals are allowed to walk in the streets and admire the tall, pale buildings. Old trees stretch up along the walls, making a good effort but it’s not the green that dominates the city. It’s not the stone and glass either, it’s about something else. The charm of the Big Smoke starts somewhere in the cracked pavements, continuing up the grimy streets and random alleyways, into the little squares with their cemented benches and unexpected moments of calm. We potter around the city, feeling like we’re a part of something. It’s vast, this city, enough so that it sometimes feels like this is the whole world. Pass the city limits and you will drop off the known universe. It’s a demanding love, London, draining its people with long, dusty streets and cramped buses. This isn’t a place for flowers, it’s a place that tests the human spirit. If you want it badly you can have it, but you will wince slightly with the push of each step. Out East there are no grandiose monuments and our towers are run down council estates, carrying their concrete smell and graffiti-covered corners like badges of honour. The canal weaves through the neighbourhoods, with walkways on either side and flowers living among broken bottles under the benches. Keep going and the canal becomes a river, the parkland becomes a marsh and still you haven’t left London. When it rains, London gets wetter than any other place in the world. Tourists are startled at the fervour with which the water splashes down, how it pummels the ground. On a good day it goes on for ten minutes and it’s gone, on a bad day it doesn’t stop and it keeps going for several more. My hallway is lined with damp shoes, one added per day of rain until I run out of dry footwear and have to circle back to the least wet pair. I scrunch up newspaper and stuff it into the shoes to soak up some of the water, looking over at my sandals and wonder when the weather was ever good enough for them to get worn down like that. When London rains, it’s hard to remember a time when the damp didn’t creep into your bones. Then it stops raining, the pavements dry and the dust kicks up again like nothing ever happened. I walk across Waterloo Bridge and realise for the hundredth, for the thousandth time, how much I love this city. Late Sunday afternoons in Victoria Park and all you can hear is the rustling of the leaves and the nattering of the Eastenders, in their loafers and wayfarers next to their knocked-over fixie bikes. A year passes and I don’t move, but the city moves around me and change is constant. The universe circles around London and when I go away I can feel the pull of its gravity. As much as I love to travel, on the plane back to London there’s always a feeling of things righting themselves. Knowing a slow journey in a grimy train is ahead of me, I drag my bags across the carpeted arrivals halls of Gatwick airport, happy to be home. I’m grateful for London, she makes me what I am. Posted on 03/01/2014 by Jess. 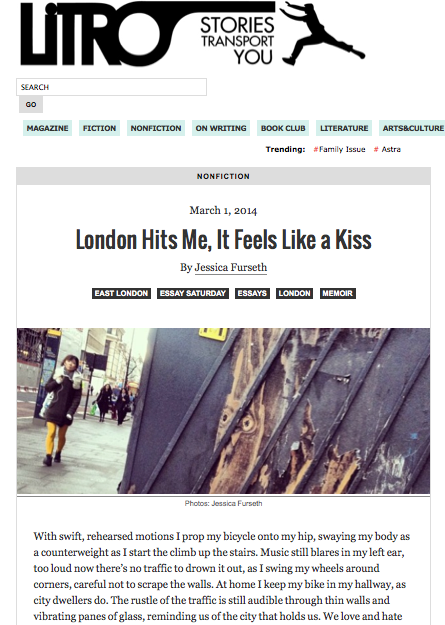 This entry was posted in Essays, Travel writing and tagged essay, home, litro magazine, london, travel. Bookmark the permalink.